The USMLE recently released the percentile rankings (PDF) for scores on all three board exams taken between 2015 through 2017 (updated May 9, 2018). The USMLE does not publish percentile rankings with individual scores and only provides this kind of data to the public every couple of years. In the tables below we have kept the data from previous reports, but the graphs and analysis are updated to reflect the 2015-2017 data. 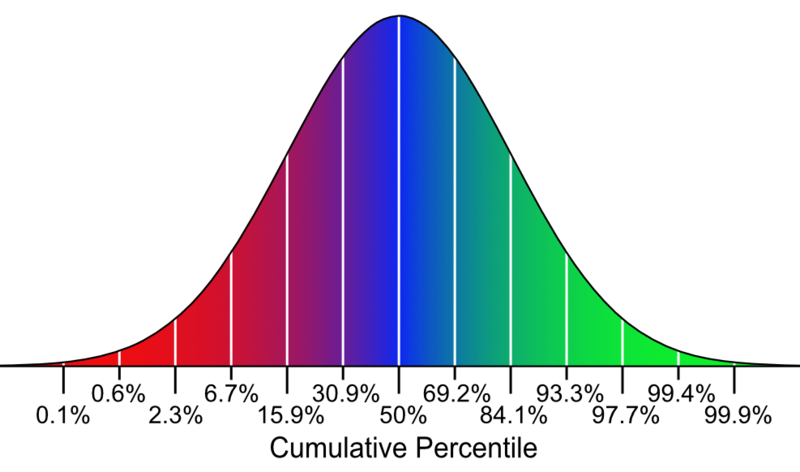 This information is very interesting because we can see the actual distribution of scores compared to a normalized distribution, or standard bell curve, that we typically assume when calculating a percentile rank for USMLE scores. Let us get right into the data. The following is the table showing the mean and standard deviation on USMLE Step 1 for US and Canadian students. What is the actual distribution of scores? Is it close to a normalized distribution or is it skewed? What do the different distributions really tell us? How accurate is our percentile calculator? The following review books and resources are the ones I found most helpful throughout medical school and are kept up to date (last revision September 2016). Reading these can help you learn the topics most likely to be tested on the USMLE Step 1 exam. If you are looking for USMLE Step 2 or 3 books you can find them here. Here is an example of a 4 week study schedule for USMLE Step 1. This is the study schedule I used to review for Step 1 and ended up doing very well. This study schedule uses First Aid and UWorld Step 1 Qbank. I recommend these review books to supplement your First Aid reading. Notice that the primary focus in this example is doing practice questions, as they are the most effective study tool. The reading material is less important and you will be moving very quickly through First Aid. This is assuming that all the First Aid content is a review for you as you should have already learned it in medical school. If you did not do well in your first two years of medical school, especially in pathology and physiology, you may need to spend some extra time in First Aid and the review books. If you feel that 4 weeks is not enough time to prepare, anywhere from 4-6 weeks may be better for you. Simply adjust the number of questions and reading accordingly, but keep this basic schedule, doing at least 3-4 full practice tests using UWorld questions prior to your exam. This is written specifically for the board exams (Step 1, 2, and 3) but you can apply these tips to most exams. Remember to get in the habit of applying these tips when using practice questions so that when you are taking the real exam all of these strategies come naturally. UWorld is a very good resource in studying for USMLE Step 1. The most powerful way to remember content is to be tested, to answer questions. The Q-bank enables you to do this with thousands of questions that are similar to those on the actual exam. Preparing for USMLE Step 1 is daunting. You know it is the one of the most important test you will ever take, and it will determine what type of residency you will be able to get in to. All that is true, but do not worry too much – with the correct preparation you can do well on Step 1. As I mentioned before, the most important part of preparing for Step 1 is learning as much as possible and doing well in the first 2 years of medical school. You should give yourself about 4-6 weeks of intense preparation. Any shorter will probably not be enough, and too much longer will make you burn out. Set up a reasonable study schedule before you start and try to stick to it. Here is an example of a good study schedule that I used when preparing for Step 1.